Not all YME users can create route options on public transport or add attributes to them. Every route on public transport includes all the stops that vehicle makes. 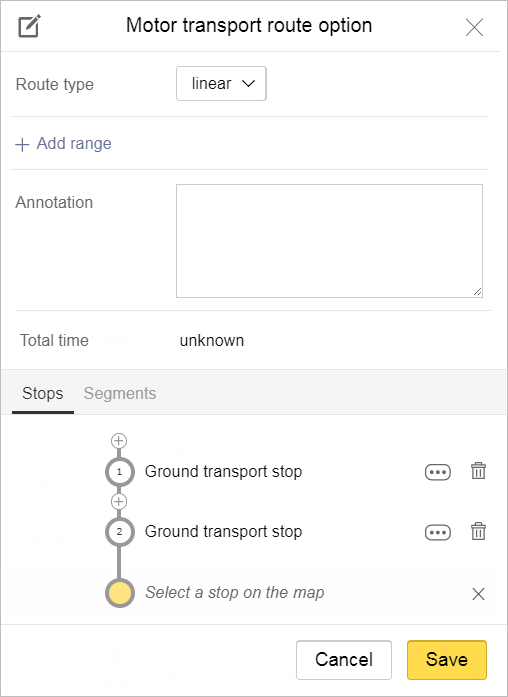 You can add options to the route that contain information about the vehicle's path along the route, the time interval between arrivals at the stop, waiting time, and the time the vehicle spends traveling between stations. Even the simplest routes include two options (i.e. the option that runs in each direction), so for each public transport route that goes in both directions, you should create at least two route options (from A to B and from B to A). 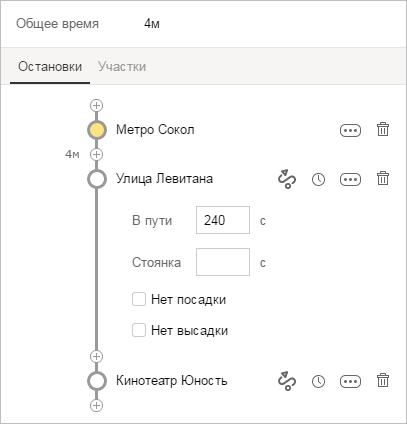 Indicate the working hours for the route using local time (i.e. the current time in the location where that transport system operates). 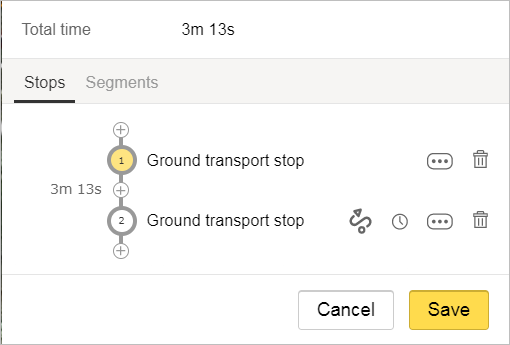 You can not create a route option without indicating the time interval between vehicle arrivals and the time the vehicle spends traveling between stops. Create route options based on routes and public transport stops that were created earlier (i.e. you can add them successively to a route option). Choose the type of route thread: Linear or Annular. The ring only includes options where the first and last stops coincide and it's possible to continue along the route without getting off at the last stop. Route options where the first and last stations are different are linear routes (even if the route resembles a circle). For more information, see The Route option field. To add information about how often a vehicle makes a route, click Add interval. We recommend entering different time interval values for morning rush hours (6-10 am), mid-days (10 am-5 pm), evening rush hours (5-8 pm), and late evenings (8 pm till the last route). If a vehicle's headway doesn't change during the whole route option, you only have to fill out the field group once. If a vehicle's headway differs during workdays and weekends, you should assign different headway values for the corresponding day types. Fill out the Annotation field by labeling every value. Time intervals should not overlap: only one interval should apply to any given time. The starting and ending time for the interval should not be the same. Time period during which a route option operates. Enter the beginning and ending time for the route using the HH:MM format. For example, 05:00 ─ 23:59. Period (of calendar year) when route option operates. Enter the beginning and ending period using the DD:MM format. For example, 01:01 ─ 31:12. Total time — the total time that the route option operates, which includes both time en route and waiting time at stops. This value is calculated and entered automatically (see points 2.6 and 2.7 below). To add a stop, click . To delete one — . 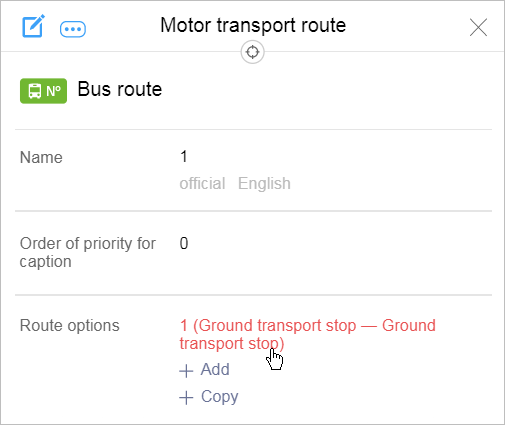 To generate a route by motor vehicle from one stop to another, select a stop and then click (Set route to/from selected stop) next to the appropriate stop. The route will be plotted automatically. You can only plot an automatic route for motor transport. Routes are plotted manually for trams. 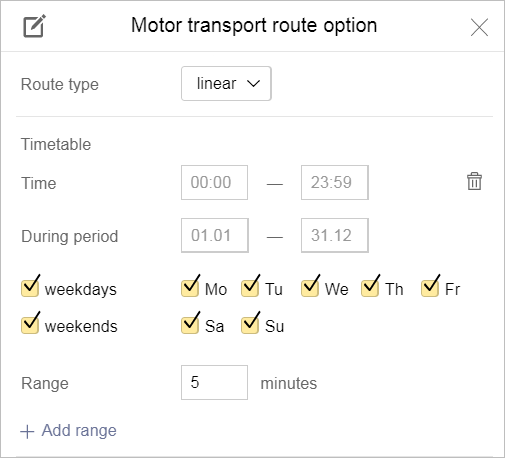 To generate the itinerary for a motor transport route, go to the Sections tab and either add a section to the route or exclude one from it. To add a road section to a route option, click on it. Click again to exclude it from the route option. To calculate the time it takes for the vehicle to complete the entire itinerary, select the first stop and then click Calculate time en route to/from selected stop next to the last stop on the route. When time is automatically calculated, all manually entered values for the time en route will be replaced by the automatically calculated values (see section 2.7 below). 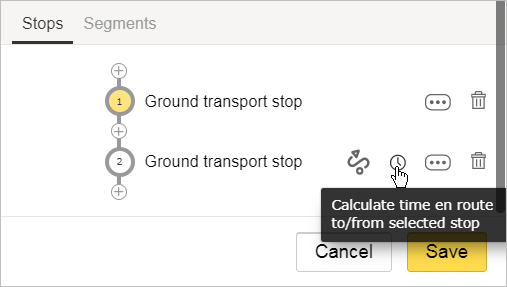 If you need to correct the time en route that was calculated automatically, select the appropriate stop and click Advanced mode: . En route — enter the time en route between the highlighted stop and the following one (in seconds). Wait time — enter the length of time that the vehicle remains at that stop (in seconds). No entering — check the box if passengers can not board at the station you selected. No exiting — check this box if passengers can not exit at the stop you selected. Click Save to create a new route. The specific route option (linear or ring, see The Route option field above) is determined based on location and whether or not passengers have to get out at the last station (at point A and B). If the route goes from point A to B and back and passengers have to get out at the last station (i.e. you can't continue riding without exiting the vehicle), then create a route using two linear options (A→B and B→A). In these cases, the exit and entry points at the final stops (A and B) are often in different locations. For example, they may be on different sides of the road. If the route goes from A to B and back and passengers can go past the final B station without exiting and paying again (because point B in the route has a “pseudo-ring” structure) but passengers must exit at the final A stop, then create one linear option for the route (A→A). These type of route options are “considered” linear since you can not transit through the final A stop. If the passenger entry and exit points coincide at the final A station for the second type, but you can not transit through (i.e. all passengers must get off and the vehicle may shut down), create one linear option for the route (A→A). If you are not required to exit at the last stop on the route and passengers can pass through both A and B (in a circle), create one ring option (if the vehicle goes in one direction) or two ring options (if the vehicles goes in both directions or in a circle). In these cases, you can start a route from any ending station, but it's better to use the one that most routes start from.